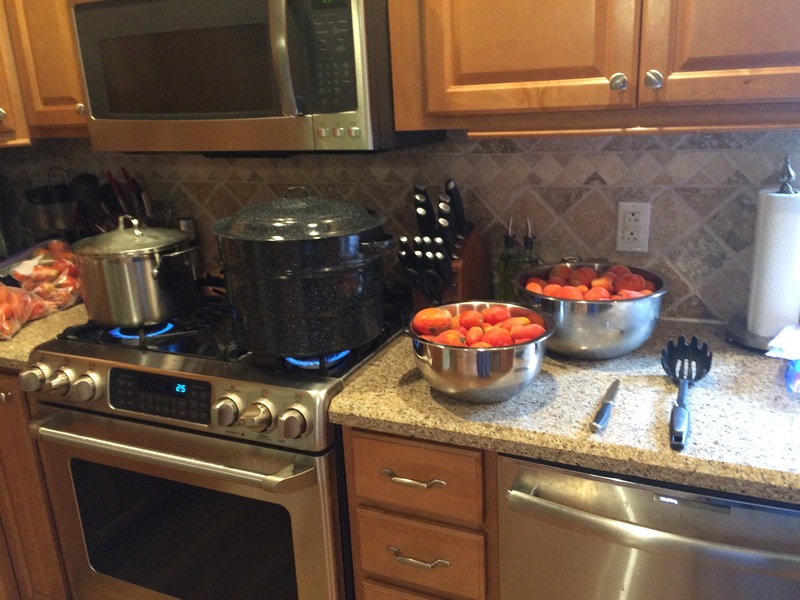 This is my third year of canning tomatoes. 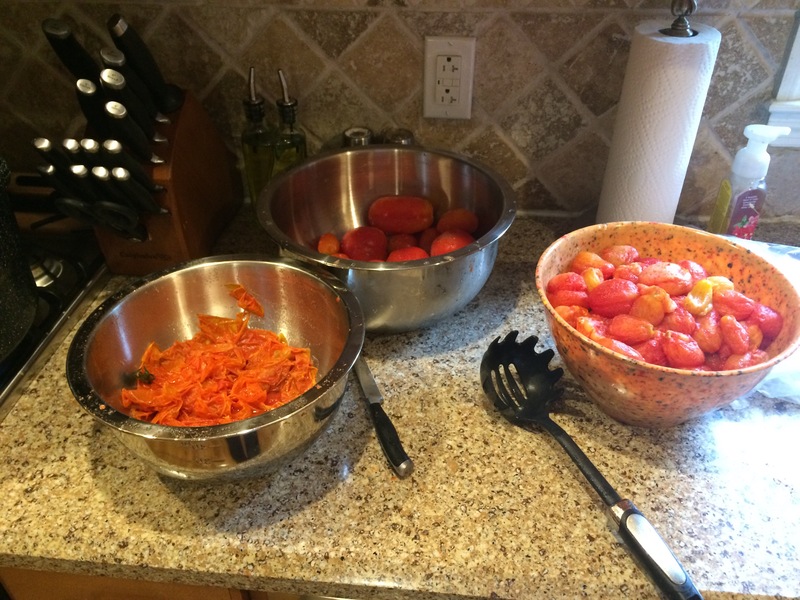 Nick loves gardening and the first year that we had the garden, I was so excited to make my own tomato sauce. I looked up a ton of recipes and ended up with a recipe that had a ton of ingredients (tomatoes, onions, carrots, celery, garlic, balsamic vinegar, red wine, etc.) It was a lot of fun to do, but I had some ideas for improvement. The sauce turned out pretty watery and I spent a LOT of time doing prep work. I also didn’t feel like the added elements enhanced the sauce, I realized I prefer a simpler, more tomato-y tomato sauce. The next year, we didn’t have a garden as we had just moved into our house in Wilmington but I bought about 20 lbs of tomatoes from a local CSA and canned whole tomatoes. It was so much easier! And the tomatoes made a great base to crush up and add some garlic/onions/basil to, to make an easy sauce for pasta. This year I decided to meet in the middle of those two attempts. 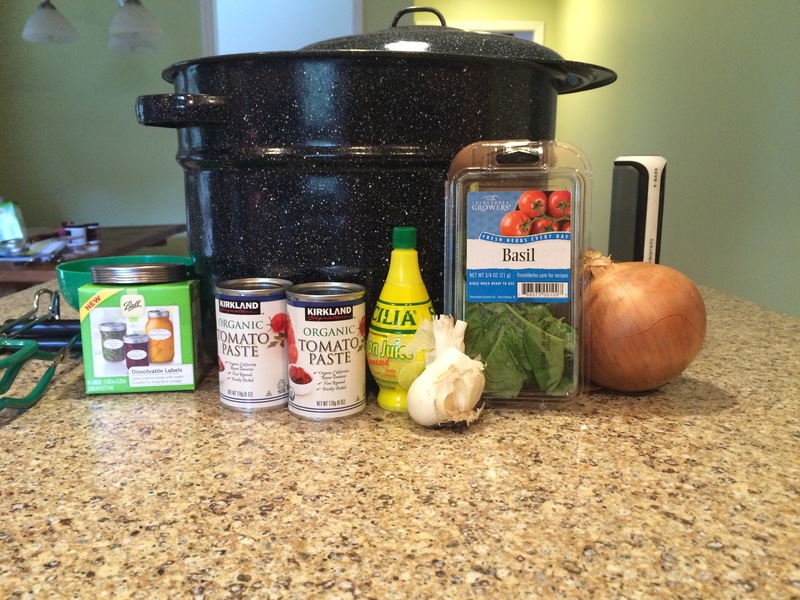 I wanted a sauce that was simple and less time consuming, but also ready to use right out of the jar. If you are doing it all in one day like I did, the whole process takes about 4 hours (with a fair amount of inactive time in there where you could do other things). So, get your space set up, get in some comfy clothes, put on some good music (maybe grab some wine 😉 ) and get to working. If you are planning on canning the same day as making the sauce, you should decide now how you are going to sanitize all of your canning materials (I know. The first step in prepping our tomatoes, and we aren’t even talking about freaking tomatoes). My dishwasher has a high temperature, sanitize setting so I used that. It takes about three hours to run, so I started that now so it could run while I was working. You want the jars to be warm/hot when you fill them, so that the glass doesn’t crack or break. Since the cycle would be ending right as I would be ready to can, they would still be warm from the cycle. 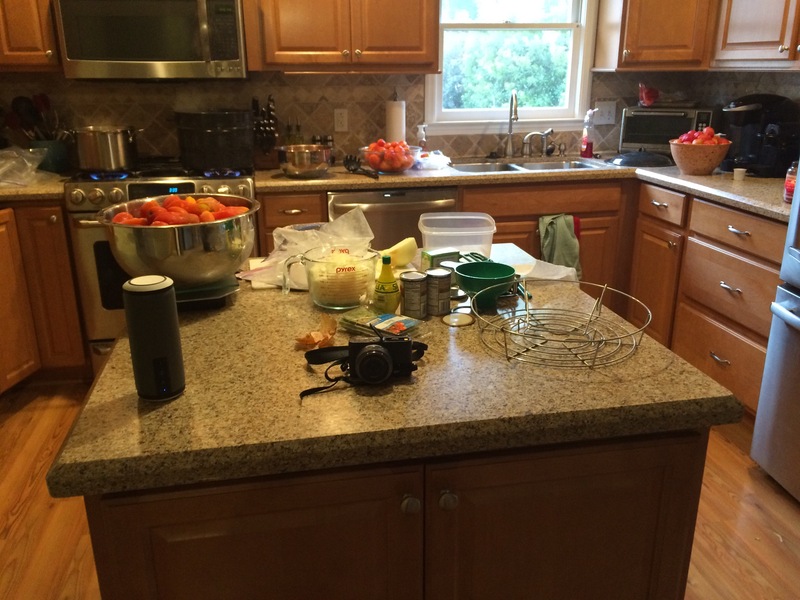 Another option to sanitize is to put the jars in simmering water. If you take this approach, you can wait until you are closer to can to worry about your jars. See this Ball post for more directions. Now, on to the actual tomatoes! We need to get these bad boys peeled. 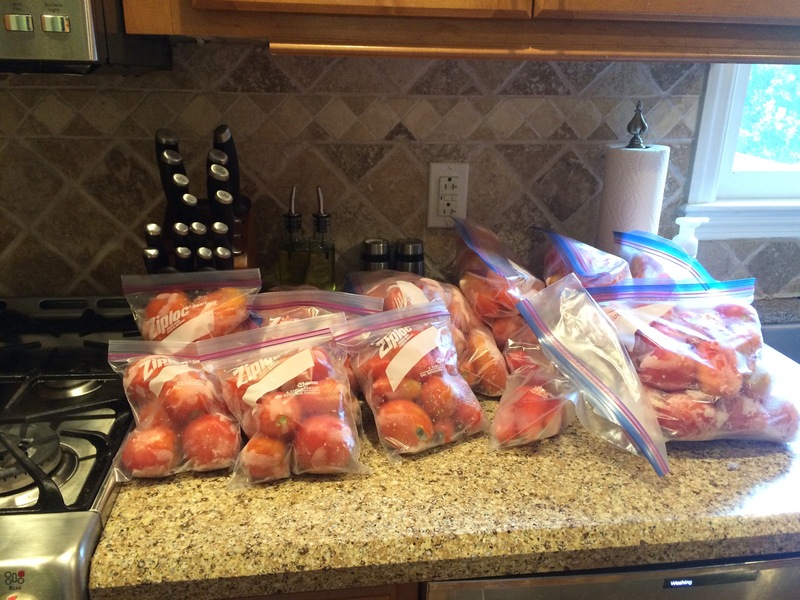 To do this, we are going to get two pots of boiling water going and get all of our frozen tomatoes weighed out and in bowls, ready to go. 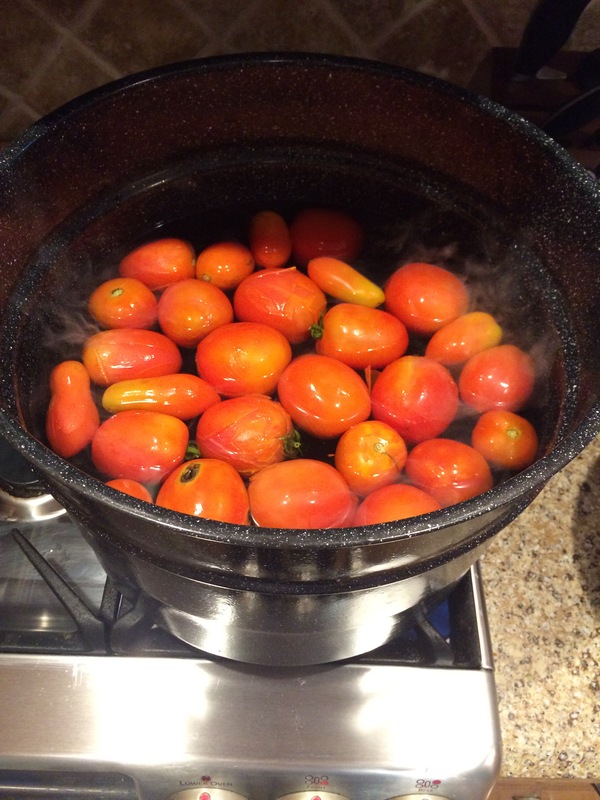 We are going to submerge the tomatoes in the boiling water for 30 seconds – 1 minute (however long it takes for the skin to start peeling away). While waiting for the water to come to a boil, I did some other prep work and chopped up my onion. 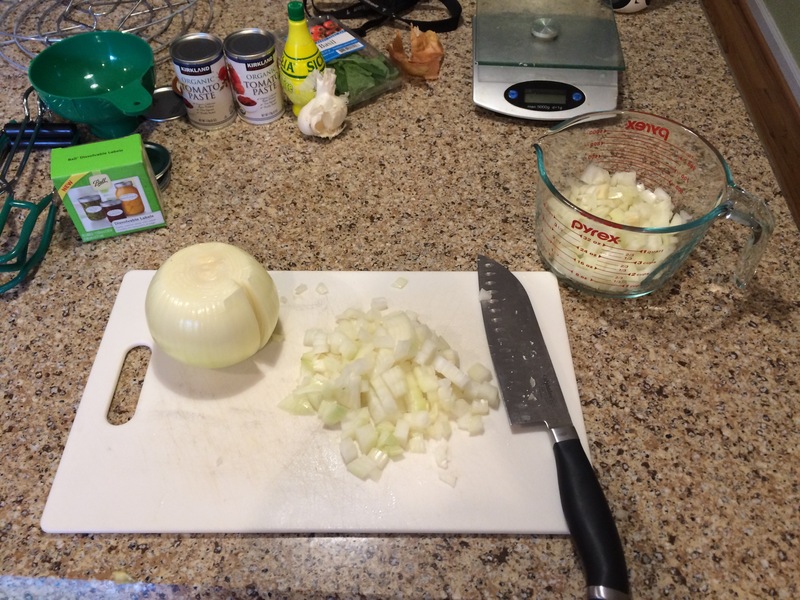 I used 1.5 giant softball sized onions to yield 4 cups of chopped onion. Once the water is boiling throw some tomatoes in. You can see in the pic below how the skins start to peel back. Once that happens, you can take the tomato out (I used a pasta scoop to rescue the peeling tomatoes) and finish peeling off the skin. It should come off pretty easily, for most I just rubbed and they came off in one piece. I also performed some quality control at this point and had a paring knife close by to cut out bad spots. I used a three bowl process. Bowl 1 in the far back is holding the frozen tomatoes ready to go in. Bowl 2 on the front left is where the tomatoes go after coming out of the water and to be peeled. Bowl 3 on the right holds the naked, “prepped” tomatoes. At first, I tried to do this with a constant, assembly line approach with a few tomatoes at a time for efficiency. I was able to peel while the next batch of tomatoes were in the water. 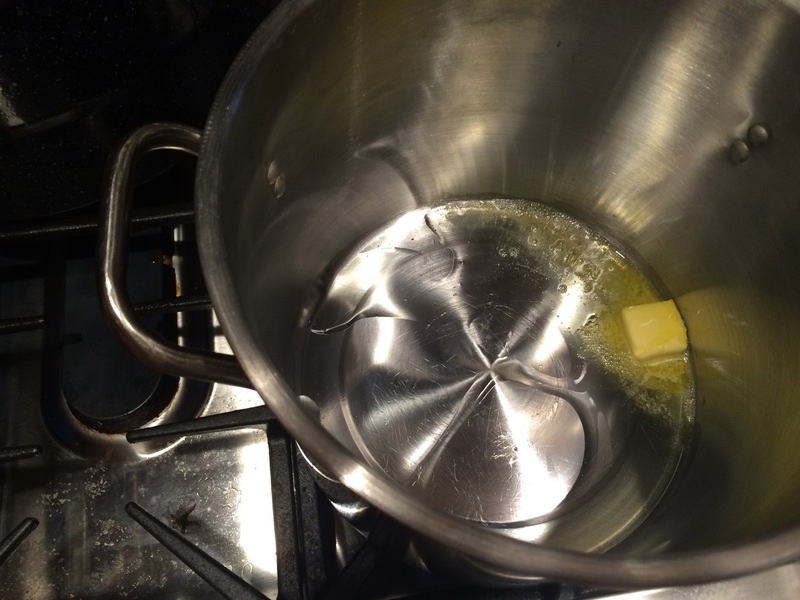 But I found that this reduced the temperature of the water too much, since it was never able to come back up to boiling, and the skins weren’t bursting. So I went to batches. I would throw tomatoes in, let them start peeling, fish them back out, and then peel while the water was empty and coming back up to temperature. Do this process over and over (and over…and over……) until all of your tomatoes are prepped. 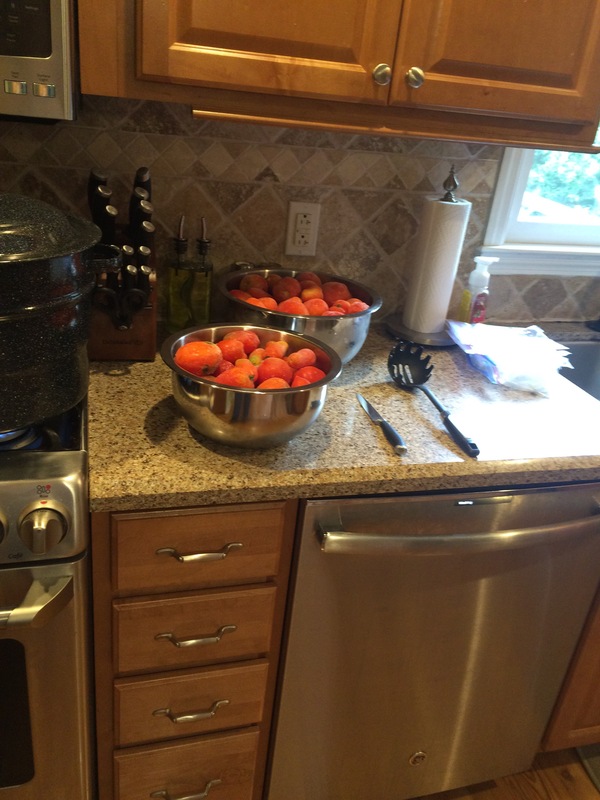 Once all of your tomatoes are prepped, you are ready to start making your sauce! 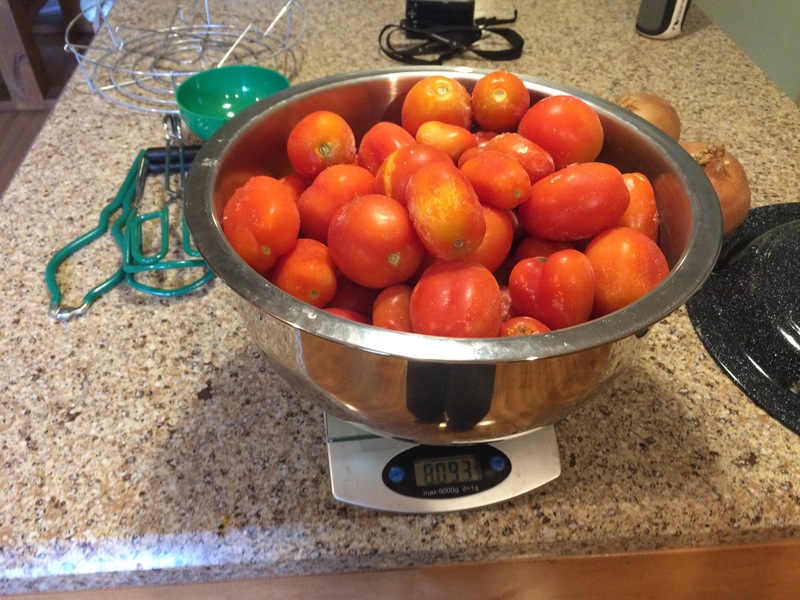 I continued with two pots, if you had less tomatoes (15 lbs or so) you could work with just one. I got some olive oil and butter going (about a tablespoon of each) and threw half of the onions in each pot. While I had it melting, I remembered that I preserved some basil in olive oil (using muffin pans and freezing it) over the summer, so I threw some of that flavored olive oil in too. 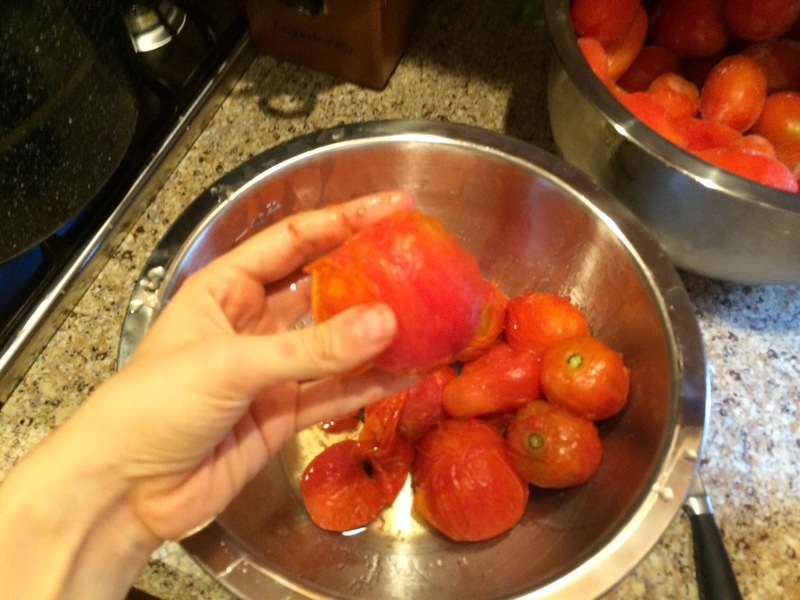 After your onions are translucent (about 5 minutes), add all of your tomatoes and juice. I let these go for about 20 minutes, to ensure the tomatoes weren’t frozen any longer and had broken down some. Then I busted out my handy dandy immersion blender. You could also use a regular blender and blend it in batches, but this could be messy and you would have to be careful with the hot sauce. If you are working with a smaller batch, this might be an ok approach though. You can see how watery the blended sauce is at this point. Next, we want to reduce and thicken the sauce. I also added three small cans (8 oz each) of tomato paste at this point to help move it along. I like doing this because you save time spent reducing and end up with more final product, but you could leave it out and just let it cook off and reduce until you reach your intended thickness. I also chopped up my basil (I used one plastic clamshell, but in retrospect I wish I would have used two) and added it at this point. I let it cook about an hour, you can see below how the sauce has thickened. This part is really personal preference, if you prefer a thicker sauce you can let it go even longer. Now for the fun part (sort of). 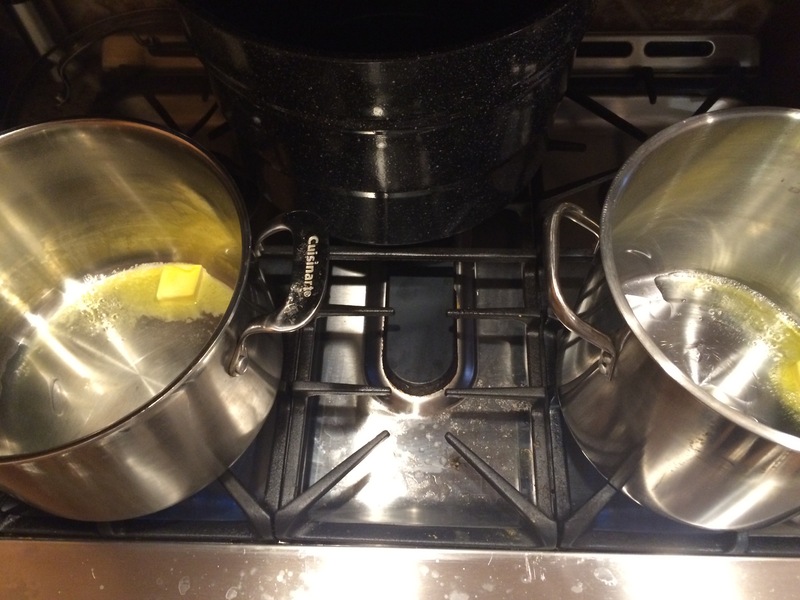 Gather all of your canning materials and fill up your boiling water canner and start heating. Using a funnel (you want to keep the jars as clean as possible), start scooping in sauce, leaving about 1 inch of headspace. After your jars are filled, add about 1 tablespoon of lemon juice to each jar (to raise the acidity of the mixture, an important aspect of water bath canning). Then add your lids and bands. Hopefully by this part your water is boiling and you are ready to process them. Tomatoes and tomato sauce take approximately 35 minutes to boil, so put them in, slap on the lid and go relax for 35 minutes. Or ya know, be efficient and do some laundry or something. I actually ran out of lids (why didn’t I check that before starting? I don’t know), so I decided to freeze our remaining sauce in ziploc bags. To do this, I waited until the sauce was pretty cool and added about 4 cups of sauce to each gallon size freezer bag. That random can on the right is sauce that I set aside for us to have this week, so it didn’t need a dip in the water bath. After your jars are finished processing, move to a dark cool place and allow them to sit for 24 hours. You will probably hear some popping as the cans seal. You want to end up with lids that don’t have any give and you aren’t able to push down. That’s the sign of a good seal! I was happy that all of ours sealed. 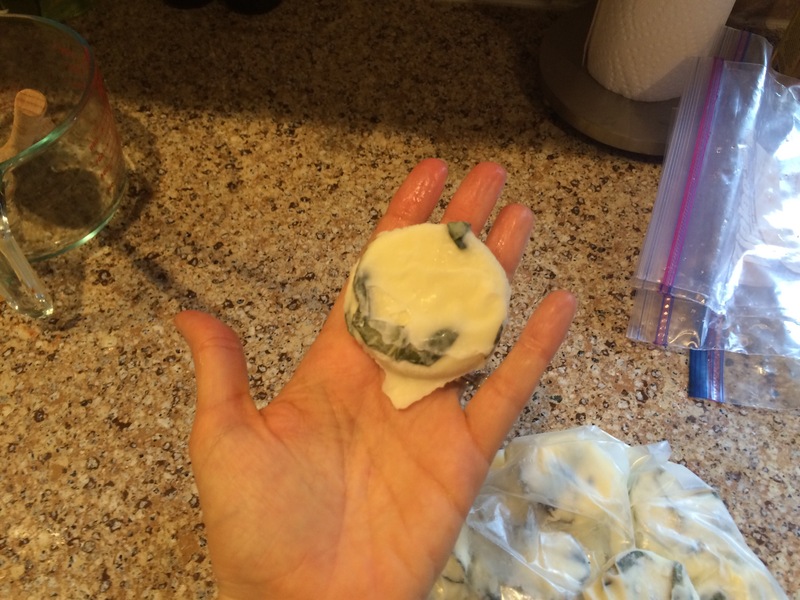 If you end up with some that don’t, you can refrigerate and eat that week, or freeze instead. Overall we ended up with 5 quart jars, 5 pint jars, 3 gallon sized bags, and one quart sized bag. 44 cups of sauce! All of our Nick’s blood/sweat/tears from gardening this summer was totally worth it. 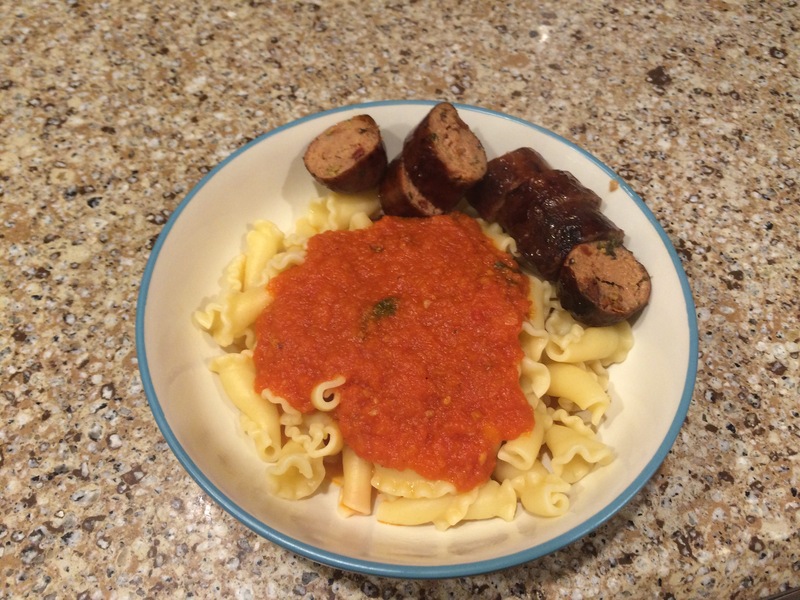 Here is some of the sauce we had this week on some campanelle pasta with a chicken sausage. Delicious! What is your favorite kind of tomato based sauce? Have you ever canned before? Good job! Looks delicious. I remember Nick picking those tomatoes every day when we visited this past summer. Glad to see it all worked out!